An enthusiastic environmentalist and animal rights activist, Hannah has a deep-rooted affliction for the world around her. Speaking to Hannah, it’s almost impossible not to catch the contagious passion flowing from her. She trails an air of inspiration and humility around her wherever she goes. But what really makes her special is her determined positivity about the impact we can have on the earth we inhabit by fighting issues that impact the planet. The organization focuses on bringing education and awareness to issues such as plastic pollution and ocean health, corporate sustainability, youth empowerment, healthy living, kindness and compassion, inhumane treatment of animals, and animal extinction. Hannah keeps herself busy, traveling all around the world speaking, volunteering, and doing everything she can to make a difference for the causes near to her heart. Her unparalleled passion for environmental issues and animals gives her the confidence to work with governmental leaders and business executives, inspiring them to make sustainable decisions. Recently Hannah has worked with Students Rebuild to help create a school curriculum about plastic pollution and ocean health. Hannah’s love of the planet is contagious, inspiring change all around the world. Her caring heart flows with passion and dedication for the cause. For this reason, she was chosen as Constellation’s 1,000th Community Champion. Through Constellation’s Community Champions program, customers can apply to receive small grants from Constellation for causes that are important to their community. Watch the video below to learn more about Hannah4Change and Community Champions! 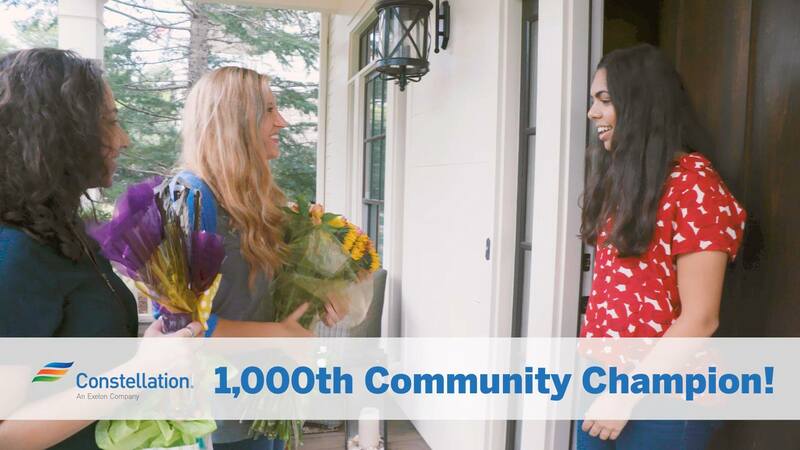 We went to Atlanta and surprised our 1000th Community Champion, Hannah4Change! To learn more about this amazing organization, watch the video below. Constellation is so much more than just an energy provider, #ConstellationCares. To apply for a community champions grant, click here. To donate to Hannah4Change, click here.